I am excited to introduce you to the newest member of the Mama Jess Team, Anna Zasada. Anna comes to us with lots of foodie experience and passion – plus she’s another great Midwestern girl! I was lucky to be raised in a household filled with good food, great home cooks, and brave home gardeners. Coming from a big family also taught me the importance of budget-friendly cooking, quick weeknight meals and an overall realistic approach to eating and living healthfully. I have a degree in Elementary Education from UW Madison (go Badgers!) and have been teaching healthy cooking classes to kids and families in Bucktown (Chicago, IL). These days you’ll find me teaching preschool, contributing to Mama Jess or in the kitchen with my husband and our dog in Barrington. I am thrilled to be a part of the Mama Jess team! Anna will be sharing her knowledge about food, cooking and all things Mama Jess in our blog and local events. She’s sure to help you (and me) eat more veggies! Below is her first Good Veggie Blog contribution – hope you enjoy it as much as I did. 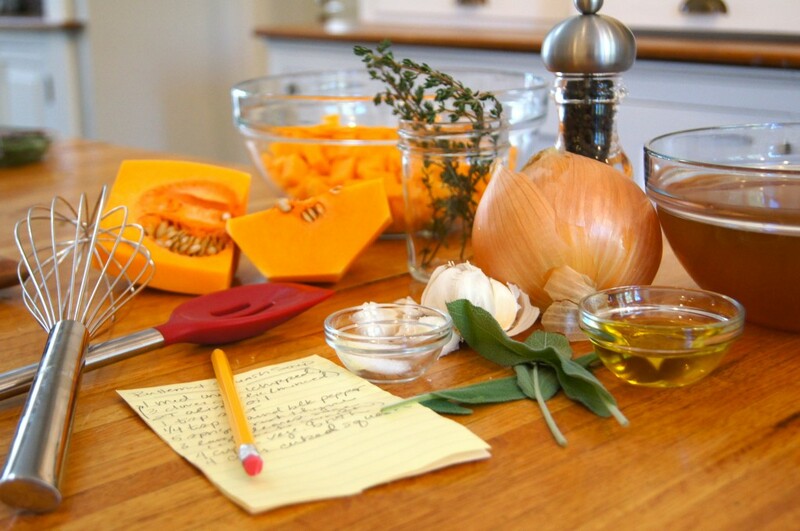 Butternut Squash is quite possibly one of my favorite vegetables and it’s quintessential Fall! Thanksgiving, for me, is the mother of all holidays. Sure, every celebration has food traditions that I love and look forward to each year; barbequing on the Fourth of July, baking cookies for Christmas and my mom’s Irish soda bread on St. Patrick’s Day. But it’s Thanksgiving that makes my heart go pitter-pat. On Thanksgiving you don’t have to give gifts, hunt for eggs or stay awake until midnight. You get to cook and just…eat. Last Thanksgiving was supposed to be my big holiday cooking debut; I was newly married, living in the big city and had a job teaching healthy cooking to kids and families. I planned my recipes and was ready to impress my foodie family with just how healthy the holidays could be. Instead, I let myself get completely distracted chatting with family and cooing over my baby niece and forgot about the simmering quinoa. If you’ve ever overcooked quinoa, you know just how sticky and inedible it can become. Whoops. While brainstorming what I would bring to Thanksgiving this year, I had visions of butternut squash starring as the main ingredient. Not only is it delicious, but it’s also chock full of vitamins and minerals and is especially flavorful this time of year. Keeping in mind last year’s flop, I decided to stick to a make-ahead dish. I wanted it to be healthy, delicious (duh) and easy to freeze. Add to the list of requirements that the dish must be vegan-friendly for my sister, toddler friendly for my niece, and crowd-friendly because it’s Thanksgiving after all! 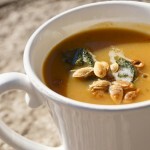 I eventually decided on a butternut squash soup. But not just any soup. This is one of the pureed varieties that I associated with fancy white tablecloth restaurants as a child. It’s topped with the roasted seeds of the squash and Greek yogurt or if you’re feeling a bit more celebratory, a few drops of brown butter sauce and fried sage leaves. So here it is; everything you wanted to know about butternut squash! Protects against inflammation, heart disease, various cancers, increases bone and brain health, and supports digestive health. Do not pick a squash with a glossy skin! The shine factor indicates that it was picked too early; stick to a squash with a matte skin. Butternut squash is one of the longest keeping vegetables; it will last over 3 months if stored in a cool dry place. Refrigeration, plastic bags and being stored at room temperature all decrease the shelf life of butternut squash. 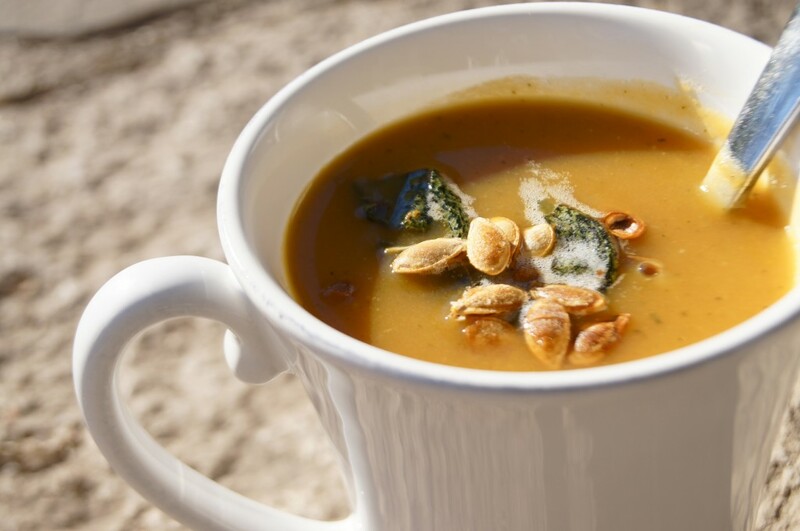 Butternut squash originated in South American and was eaten over 7,000 years ago in current-day Mexico! in a large stock pot heat olive oil over medium heat. 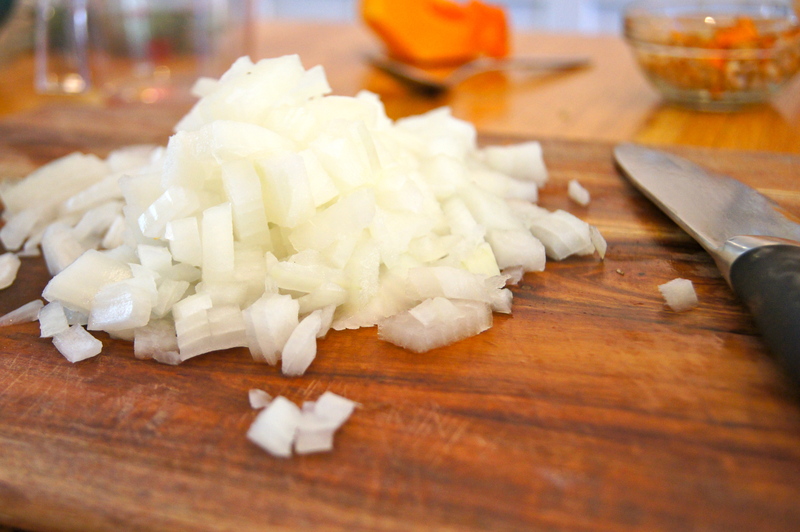 add chopped onions and sauté for 5 minutes, until onions are soft and translucent. add garlic and stir, sautéing for an additional 2 minutes. 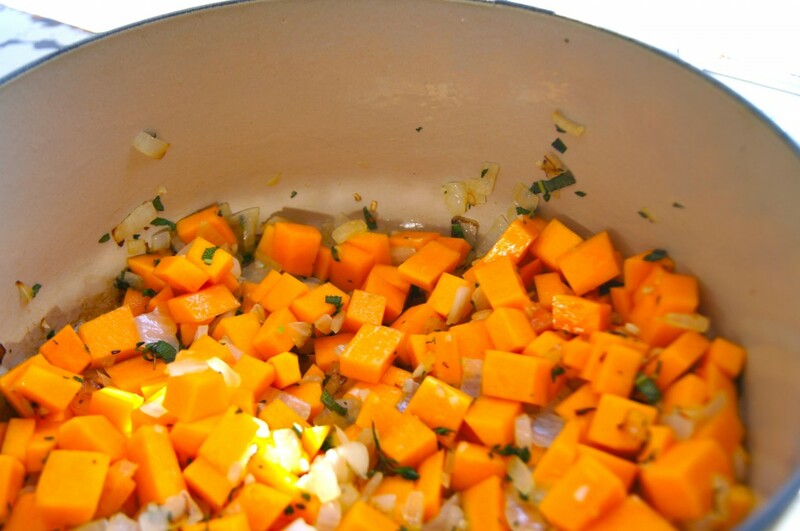 add chopped butternut squash, thyme leaves and chopped sage leaves and stir. season with salt and black pepper and cook for 2-3 minutes, until herbs are fragrant. add vegetable broth and cover, simmering for 20-25 minutes or until squash is fork tender. using an emersion blender, puree the soup until smooth. if using a blender, transfer carefully in small batches and blend on high. serve immediately, or let cool and freeze! remove seeds from squash and rinse under water until squash pulp is removed. spread seeds onto a foil lined baking sheet and drizzle with 1 tablespoon of olive oil and ¼ teaspoon kosher salt. melt ½ cup (1 stick) unsalted butter in a small saucepan over medium heat. add the sage leaves and let cook for 3 minutes until butter begins to brown and sage leaves become crisp. season with salt, to taste. 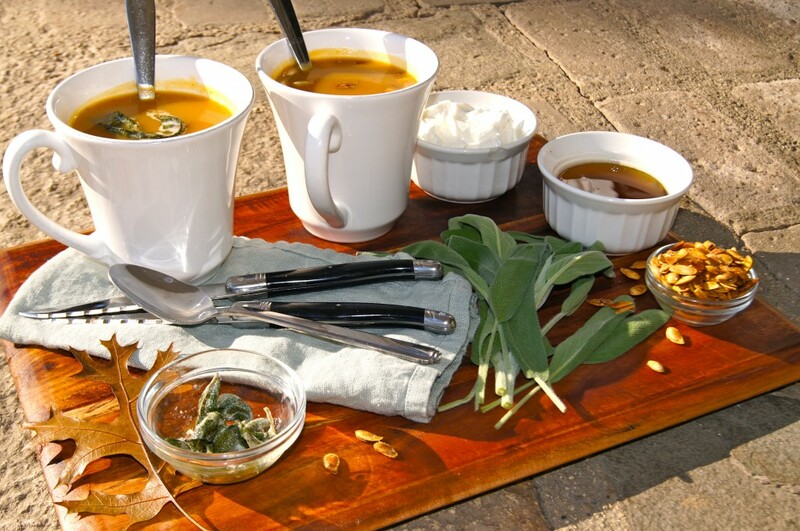 drizzle a few drops of the sauce on top of the soup and garnish with a fried sage leave!